One of the most characteristic objects of Manila are the Jeepny’s. The colorful long vehicles used as a public transportation. On our trip to Greenhills we started out on one of these. We aimed for Bliss yoga at Greenhills for today’s practice. Our class card is valid there also, so we thought to test that studio to. Greenhills is the area in Manila you go to for buying fakes. Wether it be watches, purses, clothing or electronics. This is the place to find the cheap versions of everything. Lonely Planet describes it as: “Goods of questionable authenticity”. Politically correct way of saying fakes and frauds. Enough of today’s lectures. 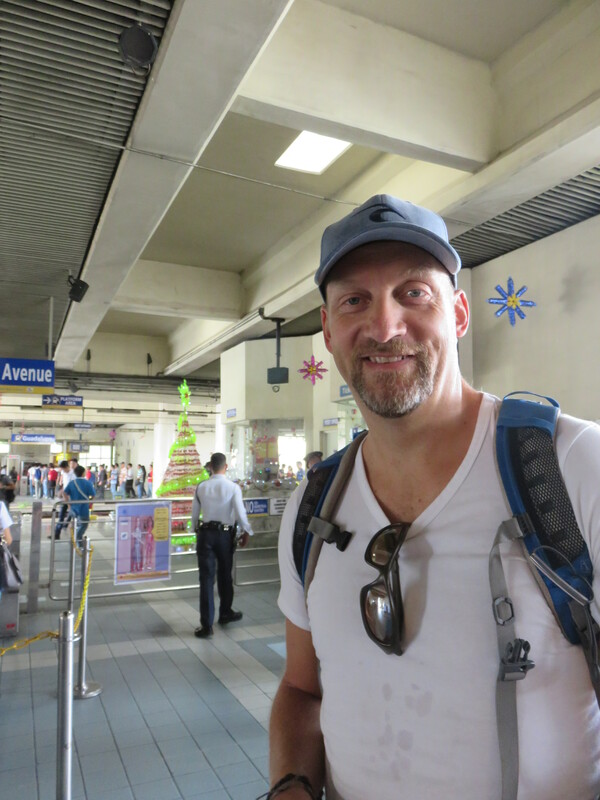 In Manila Guadalupe is s train station for the Metro train (the MRT, Metro Rail Transit System). It’s mostly above ground (only two stations are below) and is more similar to a sky train than a subway. To get there we took a Jeepny. First we almost boarded one that runs down our street, the Makati avenue. Luckily Katja asked and we got pointed in another direction. We found the one moving directly there and not through the “morning” traffic through Makati central. The term “rush hour” seems more and more weak to me. The traffic seems pretty constant. We got of the Jeepny at the right stop due to smiling and helpful people on board. They almost laughed loud when we got our picture taken inside the Jeepny. I think they had a nice ride to work. These vehicles are most certainly made for the local population for the space between the seat and the roof did not allow for me to keep my back straight. Thank higher powers for no big holes or bumps in the road. That would’ve broken my neck. We entered the railway station and Katja’s research made it easy to buy a ticket to the right station. The MRT was crowded up to a point where it reminded me of the subway in Tokyo. When we thought it full 5 more people just pushed their way into our closest door. All on board! The X-mas decorations are everywhere. Fernando, our taxi driver from yesterday claimed they started decorating in September. 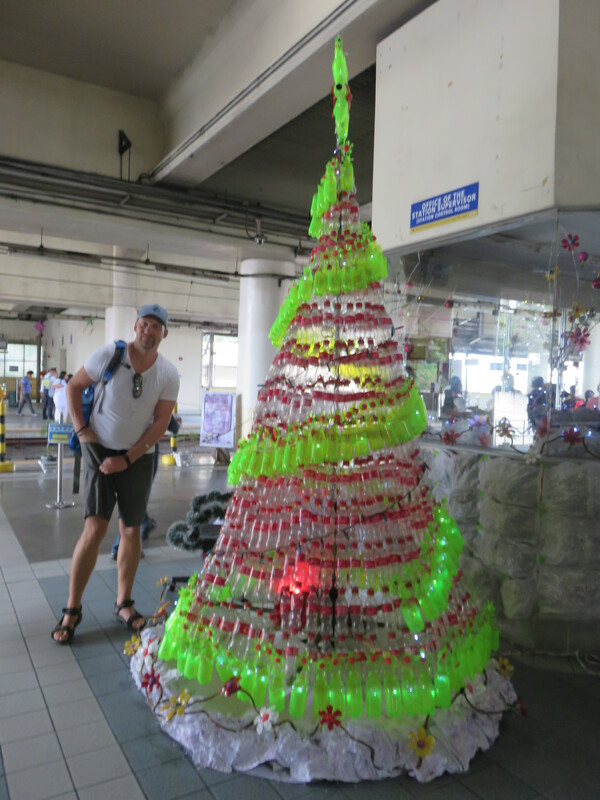 This tree was outside the kiosk at the Metro station, made of plastic coca cola bottles. where we wanted to go and we needed to enter another vehicle to get there. 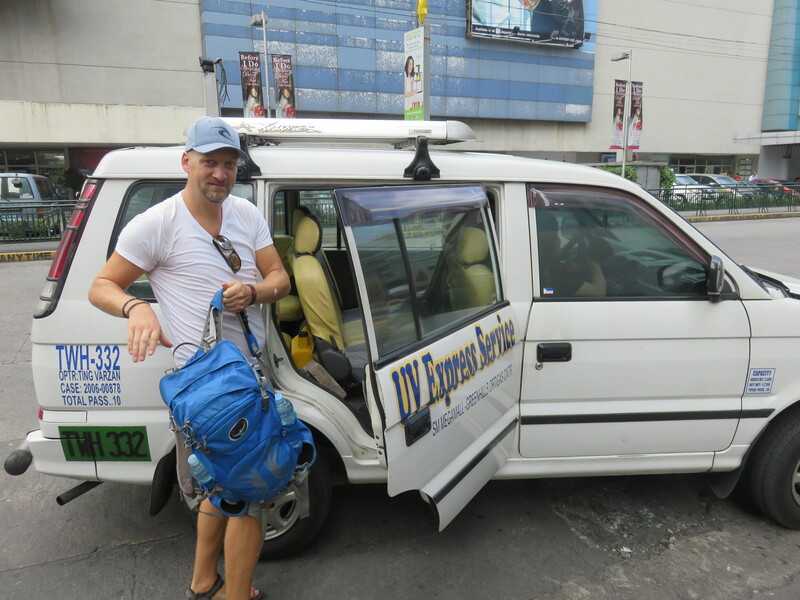 We took a UV Express, supposedly the fancy new version of the Jeepny. Don’t get fooled, it was more worn down and less friendly. 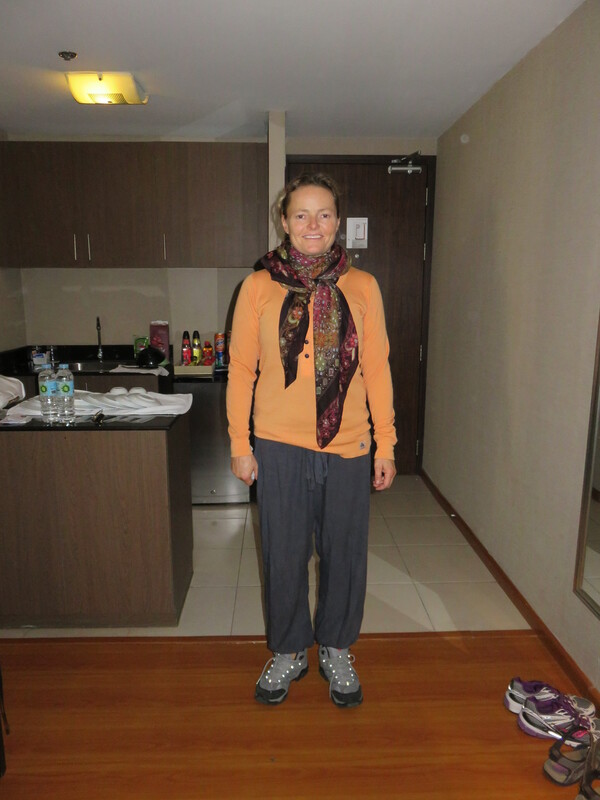 But we got across the big street and landed just 10 minutes walk from the yoga studio. As this is written it’s 20 minutes to class that starts at 13:00 and I’m gonna change now and do some stretching before we begin. The teachers name was Pio and he was as good (read:bad) as that Qi Gong teacher at yoga barn that I have previously written about. Late for class , no teaching and charisma as a mussel. He held his own practice and just said out loud what he did. No teaching involved at all. Ugh! At least we got his name from the reception and can avoid him in the future. But the place itself was nice. As rush hour (a wide term as previously mentioned) starts at 15:00 we wanted to get into a taxi and in direction of Makati before that. Once again we found ourselves getting passed over by drivers that don’t want to go in that direction or to that destination. Finally a Chinese guy took us in and we got into traffic again. We were greeted by the taxi’s owner as he passed us by in another car. Our Chinese driver spoke little English, but did his best to explain what just happened. And then he got himself some peanuts from a street kid. Those who know Katja well know she’s a squirrel and love nuts in general and peanuts specifically. Now she got all excited and wanted to buy nuts too, but we had already moved on. She was holding money in a clenched fist just hoping and praying for another sales kid to show up at a red light. No one did. We found the vegetarian restaurant Pino with no problem. There were more traffic out of the city than toward the center, so the ride was quicker than expected, but the place was closed. The security guard told us they were open 11-14 and 17-24. Veggie food another time, then. ‘Cause what do you do when you can’t go grazing vegetarian? You eat another being that has been grazing! Just around the corner was “The Burger Project”. A place where you could tailor your own burger and add ons. I wept no tears as we entered the joint. The burgers were great and the milkshake’s to. Full and happy we walked back up to the hotel. We spent 15 minutes getting ready and we went out again. This time to watch a movie in the cinema next door. We watched the movie “The drop” one of Gandolfini’s last movies before he departed. It was kind of strange, but likable. The plot twisted nicely and I did not see the ending coming. We went by the supermarket on our way back to pick up some things. Like in Norway some products are priced to insanity. I looked at Orange juice and found one I liked. It was 883 pesos. That’s 147 NOK for 1,5 liter orange juice. In the Philippines! Katja was wondering if it was made out of Virgin oranges. Needless to say I got another brand and will forever be haunted since I don’t know how good the other on is. As the burger from lunch is still occupying most of our mid sections we decided to skip dinner and finish yesterday’s bread instead. So now we’re just chilling, blogging, and will (as always) get to bed early. A little more pictures that did not make it into the text today. ArmyNavy – a natural name for burger joint, or? I would like to challenge you to a bout of wits, but I see you are unarmed. Categories: Philippines | Tags: Food, Philippines, Yoga | Permalink.